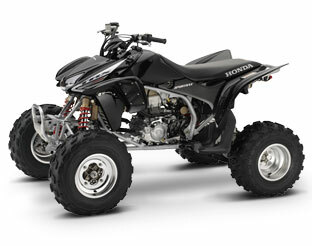 American Honda recently revealed the first wave of its new 2005 ATV models. And while Honda typically holds its all-new-model cards close to the vest until its fall dealer convention, this early release boasts refinements and interesting graphic changes to several returning models, including the awesome TRX450R and Rincon models shown here. The Rincon, available in Red and Olive, is also now offered in Black. The TRX, previously available only in Red, is also available in Black. The Rincon looks mean in the new color, while the TRX450R looks positively sinister. To find out more about Honda’s first-release of 2005 models, visit http://powersportshonda.com/ on the web. The most interesting news is the TRX450R ($6,499) is singing a new tune in its "Back In Black" color scheme. Released in 2004, the 450R retains its 42mm Keihin carb, swingarm and kick start. "In this first wave, it's mostly color or sticker updates," Honda's Ray Conway said. "We'll know more and can release more in September." • Powerful purpose-built ATV four-stroke 450cc liquid-cooled four-valve Unicam(tm) engine is based on the award-winning CRF(tm)450R motocross engine. • Compact, lightweight engine designed specifically for ATV usage is worthy of its CRF heritage. • Unicam valve train provides the light weight of a compact single-cam drive and the optimum combustion chamber shape for maximum power at all engine rpm. • Unicam valve train features a carburized single camshaft that directly actuates two 36mm steel intake valves. The camshaft exhaust lobe actuates two 30mm steel exhaust valves via a forked, low-friction roller rocker-arm. • Lightweight, compact, internal auto decompressor provides superb cold-starting and hot-starting operation. • Engine incorporates ATV-type forward kickstarting for ease of starting and light weight. • Crankshaft is made of high-strength, low-carbon steel with carburized main journals for maximum durability at sustained high-rpm operation. • Cylinder head cover is made of magnesium to reduce engine weight. • Cast 10.5:1 compression piston features 28.4mm piston skirt length, with three piston rings for added durability. • Double-carburized connecting rod utilizes a big-end needle bearing for maximum high-rpm performance and durability. • Nikasil(r) cylinder lining is lightweight and provides cooler and quieter operation for extended engine life. • Press-fitted steel spark plug pipe fits between forked exhaust rocker arms, further contributing to compact cylinder head design. • 42mm Keihin butterfly-type carburetor features light throttle effort, smooth operation and excellent rideability. • Carburetor features a throttle position sensor (TPS) that helps maintain linear response throughout the rpm range. • Twin-sump lubrication system separates the oil supply for the crankshaft, piston and valve train from the clutch and transmission. This ensures a cool supply of oil to the clutch, eliminates clutch and transmission material contamination to the engine oil, and reduces the amount of circulating oil and the required size of the oil pump. This design allows for an oil cooler and no external oil tank is needed. • Aluminum oil cooler ensures a cool supply of oil. • Vertically split crankcases feature a built-in oil pump, reducing weight compared to a conventional design. • Left side countershaft bearing and axle carrier feature double-row bearings for added durability. • Exhaust system uses a lightweight stainless steel header and muffler. • High-capacity radiator is rated at 17.2Kw for efficient engine cooling in extreme operating conditions. • Compact, flat radiator fan is lightweight and provides efficient cooling. • Gear-driven balancer reduces vibration and drives the water pump. Eight clutch plates provide the surface area necessary to handle the engine's massive torque. • Durable five-speed transmission with all-new ratios designed for ATV application. • Round-tube steel frame with removable aluminum subframe is lightweight and durable. • One-piece cast aluminum swingarm for light weight, maximum strength and durability. • Independent double-wishbone front suspension with fully adjustable Showa(r) shocks provides 8.4 inches of travel, and features rear-facing reservoirs for increased durability. • Pro-Link(r) rear suspension with fully adjustable Showa piggyback shock provides 9 inches of travel. • Dual 174mm front disc brakes with twin-piston calipers and new high-pressure front brake lines provide excellent stopping power. • 190mm rear disc and beefy single-piston caliper provide improved stopping power and increased ground clearance. • Aluminum brake calipers and brackets front and rear reduce weight. • Removable aluminum rear grabrail and front bumper for reduced weight. • Lightweight aluminum wheels reduce unsprung weight for outstanding handling. • Dunlop radial tires provide superb traction and cornering ability. • Durable and lightweight O-ring-sealed drive chain. • Engine design meets California Air Resources Board (CARB) off-road emissions standards. • Convenient oil-level window allows for at-a-glance oil check. • Long, narrow seat is designed for superior comfort and performance in all operating conditions. Saddle is also easy to remove for convenient access to the air filter. • Adjustable dual headlights with 30-watt bulbs and improved reflectors for excellent visibility and distinctive appearance. • Pivot-access brake calipers for easy pad replacement. • Engine cases protected by high-impact plastic skidplate. • LED tail/brake light for light weight and aggressive appearance. • CRF-style adjustable clutch and front brake lever. • Wide footpegs for improved rider control. • Aluminum shift and brake pedals. • Honda Racing-inspired colors and graphics. • Optional HRC(r) Racing Kit available. • Transferable six-month limited warranty; extended coverage available with a Honda Protection Plan. • Ownership includes one-year complimentary membership in the Honda Rider's Club of America(tm) (HRCA(r)). Benefits include: discounts, travel benefits, roadside assistance for ATV transport vehicle while ATV is being transported, one year complimentary subscription to Honda Red Rider ATV(tm) magazine, access to HRCA Clubhouse Web site (www.hrca.honda.com), access online to Honda Common Service Manual. For HRCA details, call 1-800-847-HRCA.